Technology jargon regularly helps people fall asleep. BMC Software recognised that IT language can sometimes have the opposite desired effect when describing campaigns, products or services. So, to remedy this BMC Software crafted two central characters with everyday problems to spearhead a campaign on ‘business service management’. 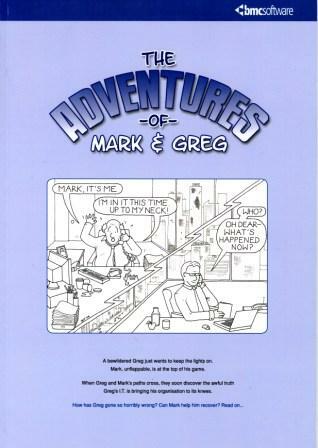 A storybook called ‘The Adventures of Mark & Greg’ was born (the idea of which was created and nurtured by Pip Livingstone and her team from BMC and written brilliantly by Richard Carter from Talkies in NZ). My job (a dream job) was to illustrate it — letting illustrations accompany the copy and helping readers visualise complex concepts in everyday scenarios. 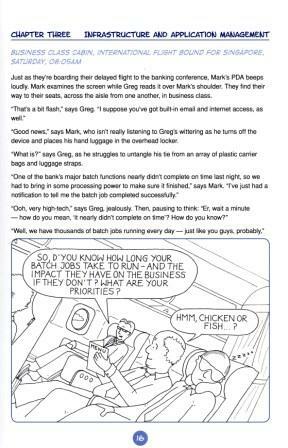 The book is based on the lives of two fictitious CIOs: Greg, who runs the IT in an error-prone technology organisation; and Mark, who runs a slick technology operation and tries to help Greg by sharing advice. The book underscored the very problems faced by CIOs every day and painted a vivid and real picture of BSM’s value. In terms of ROI, the book was welcomed by technology media and the campaign has been promoted internally at BMC as a best practice case study. In addition, the book was adopted in BMC’s global new-hire programme. Every new BMC employee is given their own copy. 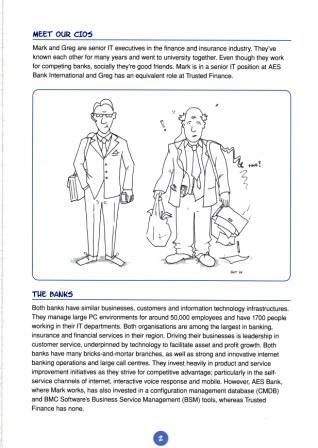 BMC also created a ‘Mark and Greg’ video based on the book, used to support marketing activities.